UPDATE: you can see the Mail’s reply – including veiled threats – here. It has been confirmed by the struggling parents who were targeted by you in your article that your colleagues at the Sun newspaper used subterfuge and lies to trick the two children and their parents into inviting reporters into their home and allowing them to take photographs. 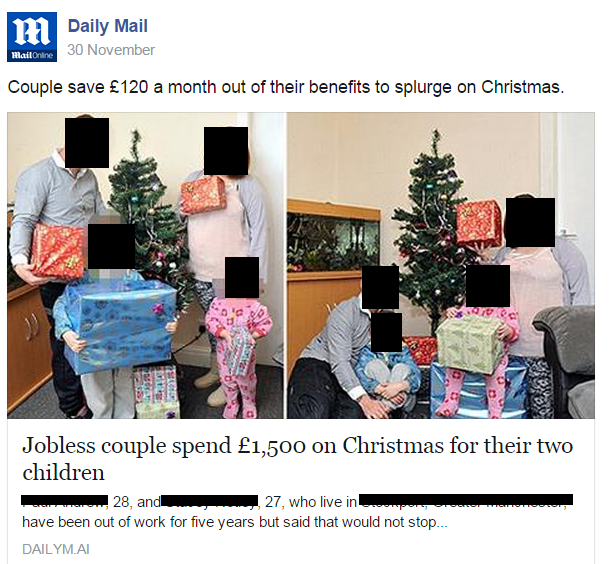 You, the Daily Mail and your colleagues over at the Sun newspaper then printed a grossly distorted article attacking, maligning and bullying the two young children and their parents. Because subterfuge, lies and distortion were used to gain consent from the parents of these children, the subsequent article you printed in your own newspaper breached at least 8 paragraphs of your own code. i) Young people should be free to complete their time at school without unnecessary intrusion. v) Editors must not use the fame, notoriety or position of a parent or guardian as sole justification for publishing details of a child’s private life. I fully expect you to have a strong word with yourself and your colleagues at the Daily Mail and the Sun, have a good laugh about it, and then carry on bullying struggling British families while you go on living your opulent lifestyles and going on your expensive holidays as if nothing has happened. I have also copied this letter to your puppets at the IPSO so they can also pretend to be seen to be doing something about it. I’ll let you know if I get a reply. Mr Paul Dacre has ruled that the article by Mr Paul Dacre was fair and balanced. It was actually deleted by accident and NOT because it was deeply offensive in any way. Mr Paul Dacre is renowned for his excellent judgement, as was seen when he also ruled that the article by a Mr Paul Dacre about the deceased father of a Mr Edward Miliband was also fair and balanced, so much so that the insinuation was repeated by same Mr Paul Dacre, even though the majority of the country mistakenly thought it was actually a sickening character assassination designed to undermine the leader of the opposition. They are the gutter press,trying to dig dirt now on any of the newera4all residents how low can they go.93 families to be evicted for greed.the Sun and Mail for the people I don,t think so,for Murdoch and greed. Anyone buying The Daily Mail or The Sun should read this, have a word with their concince and not just stop buying those rags, but pass this on to someone else who buys them and another person and another til people stop buying them, or clicking on their sites. The only way to hurt these people is through the pocket. Paul Dacre must be someone with no moral compass at all. how do the dailt mail keep finding out whos on benfits and who isnt you ant do that leggay. I wonder how The Mail and Sun would have reported the birth of Jesus if they had been in print two thousand years ago.. Oh wait, I can imagine it.. The Sun of course would run the story first because 99% of the articles the Mail print have already been in another rag first.. This is Tom Pride’s complaint to Paul Dacre about his newspaper’s conduct in running a story about an unemployed couple, who spent £1,500 on Christmas for their two children. Mr Pride points out how the article broke several clauses of the very code Dacre, in his capacity as chairman of the new press regulatory body, is pledged to uphold. Most significant is the clause that stipulates that children’s identities should not be revealed. This is one of the major requirements of journalistic ethics. It is why the identities of child criminals are hidden, with the exception of cases where a judge rules that the law may be lifted, and why the identities of the victims of paedophiles are also never revealed. Yet Dacre’s organ has blatantly flouted this in order to run yet another feature reassuring his bilious, insecure and spiteful lower middle class readers that those on benefits are all scroungers overpaid by the state. Clearly, Dacre should not be head of the body, as his very occupation of the position turns it into a laughing stock. The ghost of Lord Rothermere (circa 1930s) still stalks the editorial room of the Mail. His support for the then United Empire Party has echoes of today. Then the support for Oswald Moseley and his Blackshirts in 1933 transcends the decades to the present. Rothermeres support then for Mussolini and Hitler is just below the surface now waiting for the maybe Purpleshits of Farage’s army with the bully boys of the BNP and EDL storm troopers hiding not too far in the background. They are just awaiting the clarion call of Mr Dacre and Murdoch as modern day propagandists. As then the lower middle classes and the lumpen Sun readers who can not think for themselves have had their minds poisoned. One thing you can’t do Mr Dacre is delete history. Your attack on Ralph Miliband was your equivalent of Rothermere’s Zinoviev Letter a pathetic attempt at Reds under the bed. Nothing changes at the Dirty Mail. The one thing that has changed is the use of social media which can reach into the hearts and minds of decent people, who when stick comes to lift, will defeat your vile attempt at propping up a system that has had it’s day. The Sultans of Shame and Sham are at it again – Plumbing the depths of non-news and feeding petty hatreds.